"Homesickness" by Rene' Margritte is one of the artist's most emotional pieces. The painting was created in 1940 and depicts an interesting scene. The golden brown sky in this painting and the stance of the man reveals a more melancholy mood in this painting. Viewers also comment a lot on how the man in this painting doesn't have a top hat on, while usually all of the men in his art, do. But this man, has wings, making the viewers think that maybe this man could be an angel. The scene looks as though they are in a city like area, obviously where the lion does not belong. 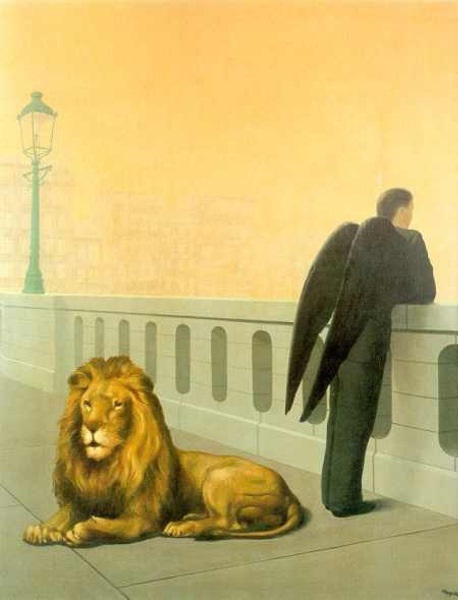 Therefore, the title of this painting shows that the lion and the man are both homesick for where they actually do come from.